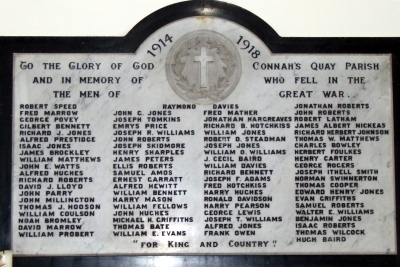 WW1 Roll of Honour Plaque in St. Mark’s Church, Connah’s Quay. Robert SPEED, Fred MARROW, George POVEY, Gilbert BENNETT, Richard J. JONES, Alfred PRESTIDGE, Isaac JONES, James BROCKLEY, William MATHEWS, John E. WATTS, Alfred HUGHES, Richard ROBERTS, David J.LLOYD, John PARRY, John MILLINGTON, Thomas J.HOOSON, William COULSON, Noah BROMLEY, David , William PROBERT, Raymond DAVIES, John C.JONES, Joseph TOMKINS, Emrys PRICE, Joseph R.WILLIAMS, John ROBERTS, Joseph SKIDMORE, Henry SHARPLES, James PETERS, Ellis ROBERTS, Samuel AMOS, Ernest GARRATT, Alfred HEWITT, William BENNETT, Harry MASON, William FELLOWS, John HUGHES, Michael H.GRIFFITHS, Thomas BATE, William E EVANS, Fred MATHER, Jonathan HARGREAVES, Richard B.HOTCHKISS, William JONES, Robert D.STEADMAN, Joseph JONES, William O. WILLIAMS, Cecil BAIRD, William DAVIES, Richard BENNETT, Joseph F. ADAMS, Fred HOTCHKISS, Harry HUGHES, Ronald DAVIDSON, Harry PEARSON, George LEWIS, Joseph T. WILLIAMS, Alfred JONES, Frank OWEN, Jonathan ROBERTS, John ROBERTS, Robert LATHAM, James Albert NICKEAS, Richard Herbert JOHNSON, Thomas W. MATHEWS, Charles BOWLEY, Herbert FOULKES, Henry CARTER, George ROGERS, Joseph Ithell SMITH, Norman SWINNERTON, Thomas COOPER, Edward Henry JONES, Evan GRIFFITHS, Samuel ROBERTS, Walter E. WILLIAMS, Benjamin JONES, Isaac ROBERTS, Thomas WILCOCK, Hugh BAIRD. 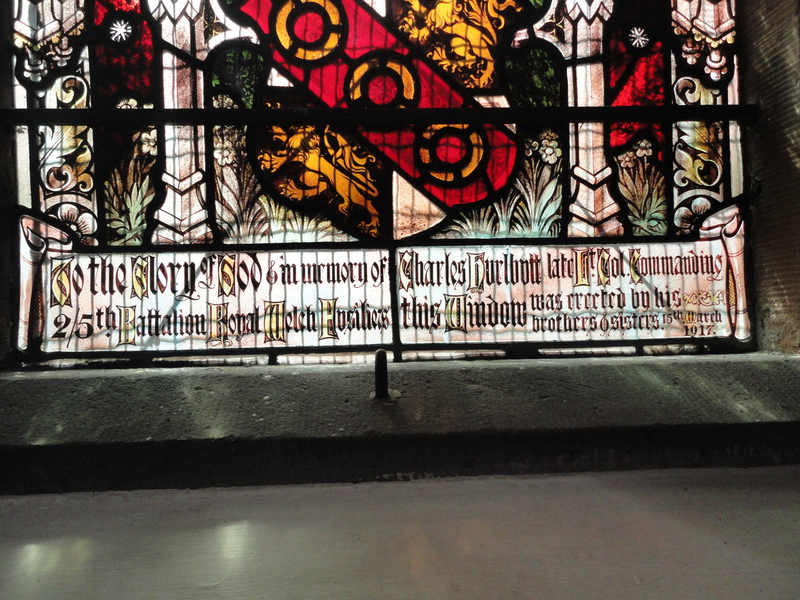 Inscription on the Charles Hurlbutt Stained glass window, presented to the church by the Hurlbutt Family.